His name is Daniel Alejandro Suarez Garza. 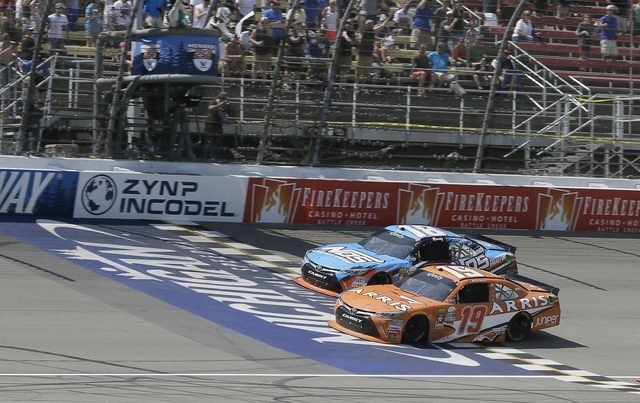 He became the first Mexican-born driver to race to victory in one of NASCAR’s major touring series when he won the Xfinity event Saturday in Michigan. His name is Daniel Alejandro Suarez Garza. He’s a Mexican, from Monterrey in Nuevo Leon. He had dreams of winning stock car races against the best drivers in NASCAR and Danica Patrick. This happened before there was talk about building a wall between his country of birth and his adopted one. 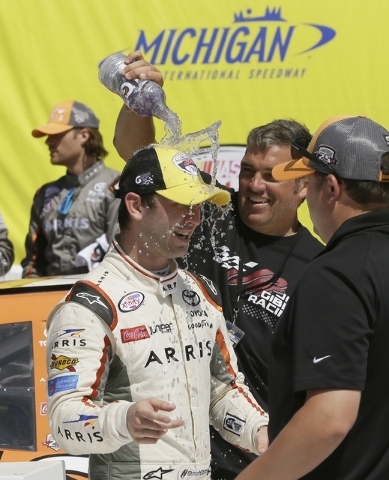 On Saturday at Michigan International Speedway, 24-year-old Daniel Suarez became the first Mexican-born driver to race to victory in one of NASCAR’s major touring series. He beat a pretty good driver to do it. 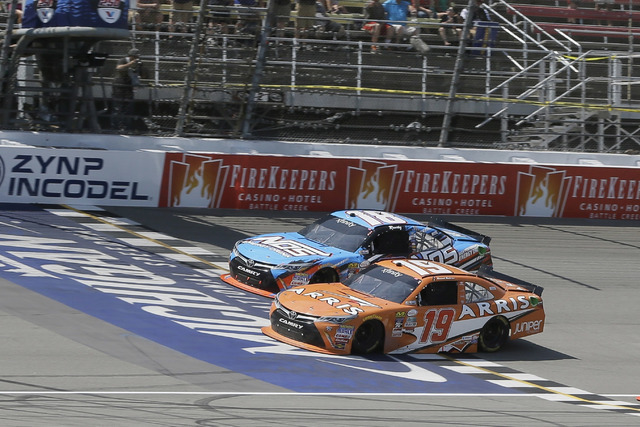 Suarez passed Kyle Busch of Las Vegas, the reigning Sprint Cup series champion, in dramatic fashion to win the Xfinity Series race at MIS. He spoke to auto racing reporters via conference call about his impressive victory serving as inspiration for aspiring young Mexican drivers, and aspiring young drivers in general. “I think it is going to help for sure,” said the driver of the No. 19 Joe Gibbs Racing Toyota. “If I was going to be in that position, if I was an upcoming driver from Mexico, in the Mexican series, or the (developmental) national series from the U.S., I would be very excited there is another Mexican driver, Latin American driver, in the national series doing something right. Suarez has great support from NASCAR. Not only is Mexico an untapped resource for the sanctioning body, but Suarez is a product of NASCAR’s driver diversity program who was on the inaugural NASCAR Next list identifying up-and-coming drivers. Others on that first list: Chase Elliott, Darrell Wallace and Ryan Blaney, all of whom now are driving in national series. But after breaking through for his first win, Suarez said he also owed a lot to the guy he overhauled on his way to the checkered flag. That would be the lead foot from Las Vegas who drives the No. 18 cars. “Definitely Kyle had been super helpful to me, in both the Xfinity Series and the Camping World Truck Series,” said Suarez, who drove for Busch in the trucks. “Since last year, he has started to support me a lot, to give me information, advice, just to be a little more prepared. Suarez is following in the slipstream of a handful of other Mexican drivers who have made it to the big time, though most were in Formula One or IndyCar — brothers Pedro and Ricardo Rodriguez raced in F-1, as did Hector Rebaque. Adrian Fernandez won 11 races in CART and IndyCar and drove in four Indianapolis 500s. 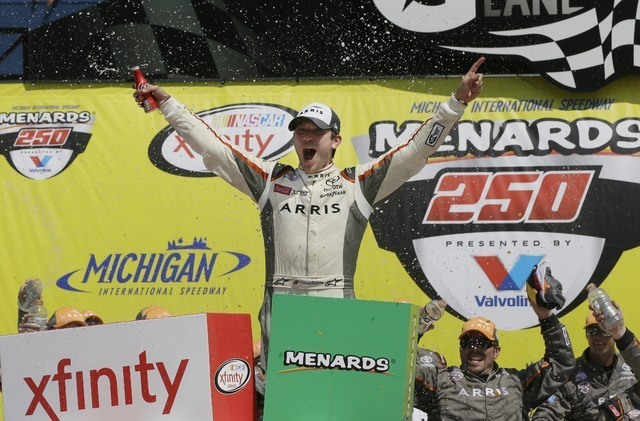 But Suarez is the first Mexican to win in NASCAR, and NASCAR seems pretty darn pleased about its newfound diversity. • You can add Kobalt 400 winner Brad Keselowski to the list of NASCAR drivers who have developed an IndyCar fetish. The reigning Las Vegas race champion drove IndyCar points leader Simon Pagenaud’s car on the Elkhart Lake road course in Wisconsin this week. Though he won’t be replacing one of Roger Penske’s open-wheel drivers anytime soon, Bad Brad did trim 10 seconds from his first lap time on his second loop of the picturesque 4.048-mile Road America circuit. “The opportunity came up to dip my toes in the water and kind of expand my knowledge base and put it in the back of my mind — for wherever it goes, I don’t know,” the NASCAR veteran said. • Dale Earnhardt Jr. will drive a No. 88 car adorned with University of Michigan colors and decals (and perhaps a small Mountain Dew logo) during the second NASCAR stop at Michigan International Speedway on Aug. 28. Somebody in the UNLV marketing department should be inquiring about putting Hey Reb’s face on one of the Busch brothers’ hoods before NASCAR Weekend 2017. Not only would it be great exposure for the football program, but it also would allow Rebels coach Tony Sanchez access to the garage area, where he could inquire about any remaining eligibility some of these brawny tire changers might have.